The nation's preeminent program in the development of cinema, television and interactive media, the USC School of Cinematic Arts challenges students to unleash their imaginations with the latest in storytelling technology. 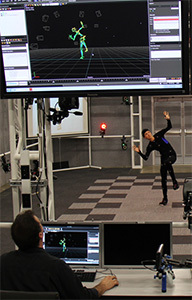 Here two students work on a project on the Performance Capture Soundstage at the Robert Zemeckis Center for Digital Arts. Photo by Roberto Gomez. The USC School of Cinematic Arts (SCA) is one of the nation's preeminent centers for the creation, study, research and development of film, television and interactive media. With nearly 200,000 square feet of facilities, the school confers degrees ranging from the bachelor's to the doctorate. SCA is composed of seven divisions: the John C. Hench Division of Animation and Digital Arts; the Bryan Singer Division of Cinema and Media Studies; Film and Television Production; Interactive Media and Games; Peter Stark Producing Program; Writing for Screen and Television; and Media Arts and Practice. The school also has two organized research units — the Institute for Multimedia Literacy and the Entertainment Technology Center. Since its founding in 1929 as the first course of study in film at any college or university in the United States, USC's cinema program has consistently set academic and professional standards for excellence. In addition, the school has a record-breaking number of endowed chairs in the discipline; production facilities that rival industry counterparts and extraordinary faculty and staff. Thanks to SCA's location in Los Angeles, students have access to the country's leading film, television, animation and video game producers; world-class literary and talent agencies; libraries and archives brimming with research materials; and alumni that support the school and the men and women in its academic body. The school is also home to USC's Trojan Vision television station. The USC School of Cinematic Arts recognizes that a student can only truly excel in his or her chosen area of expertise after exposure to all elements of the art form. Consequently, there is an emphasis on cross-disciplinary course work that ensures writers get behind the camera; critical studies scholars edit footage; and production majors examine the canon from a rigorous academic perspective. The USC School of Cinematic Arts offers professional and academic degree programs at the bachelor's, master's and doctoral levels. This program combines a broad liberal arts background with specialization in a profession. The degree is granted through the USC Dornsife College of Letters, Arts and Sciences in conjunction with the School of Cinematic Arts. The degree requires 128 units. For more information, see here. This degree is granted through the USC Dornsife College of Letters, Arts and Sciences in conjunction with the School of Cinematic Arts and requires 128 units. For more information, see here. This degree is a two-year program for transfer students. The BA is granted through the USC Dornsife College of Letters, Arts and Sciences in conjunction with the School of Cinematic Arts and requires 128 units. For more information, see here. This degree is a four-year program only available to incoming freshmen. The BFA in Cinematic Arts, Film and Television Production is granted through the School of Cinematic Arts and requires 128 units. For more information, see here. The Bachelor of Arts in Interactive Entertainment is granted through the USC Dornsife College of Letters, Arts and Sciences in conjunction with the School of Cinematic Arts. The degree requires 128 units. For more information, see here. This program is for students who want to harness the power of digital storytelling and media design to communicate across diverse fields beyond the entertainment industry. This degree is granted through the USC Dornsife College of Letters, Arts and Sciences in conjunction with the School of Cinematic Arts. The degree requires 128 units. For more information, see here. This is a unique program designed for students who wish to receive intensive training for non-fiction and fiction writing for screen and television. The BFA in Writing for Screen and Television is granted through the School of Cinematic Arts. The degree requires 128 units. For more information, see here. This program offers a unique coupling of the USC Marshall School of Business and the School of Cinematic Arts in a four-year interdisciplinary degree. In addition to the Marshall School of Business core classes, the students will also take a total of 24 units from the School of Cinematic Arts. This competitive program is offered to freshmen admitted to the Marshall School of Business as Business Scholars. Upon completion of all requirements, students will receive a Bachelor of Science in Business Administration (Cinematic Arts). See the Marshall School of Business for course requirements. This degree, with an emphasis in Critical Studies, is granted by the USC Graduate School in conjunction with the School of Cinematic Arts. This program requires 36 units. For more information, see here. This program requires 36 units. For more information, see here. This professional degree requires 52 units. For more information, see here. This program requires 44 units. For more information, see here. This program requires 50 units. For more information, see here. The Peter Stark Producing Program requires 44 units. For more information, see here. The PhD is based on a program of study and research culminating in the completion of a dissertation in the major field of study. A minimum of 68 semester units (exclusive of dissertation registration) beyond the baccalaureate is required. Applicants who have completed a Bachelor of Arts or Master of Arts degree in Cinematic Arts, or a closely related field, may apply to the PhD program. The doctoral degree is granted by the Graduate School in conjunction with the School of Cinematic Arts. For more information, see here. The PhD in Media Arts and Practice program offers a rigorous and creative environment for scholarly innovation as students explore the intersection of design, media and critical thinking while defining new modes of research and scholarship for the 21st century. Core to the program is its transdisciplinary ethos; after completing foundational course work, students design their own curricula, drawing on expertise across all divisions and research labs within the School of Cinematic Arts. The doctoral degree is granted by the Graduate School in conjunction with the School of Cinematic Arts. For more information, see here. The Writing for Screen and Television Certificate provides an established writer, domestic or international, with a one-year program of study. It is meant to accommodate a writer who has already attained significant recognition and would like to learn the craft of screenwriting. Sixteen units are required. For more information, see here. This certificate program provides graduate-level education in various aspects of the business of film, television and new media. It requires 16 units. For more information, see here. This certificate program is for graduate students from across the USC campus who want to explore the shifting nature of scholarly expression, pedagogical practice and research in the 21st century. It combines seminars with hands-on, lab-based workshops devoted to basic image manipulation, video editing, social media and Web design to facilitate sophisticated critical thinking and practice in and through multimedia. The program requires 12 units. For more information, see here. The School of Cinematic Arts does not accept courses taken in film and/or television production at other institutions to fulfill degree and minor requirements. Basic film or television history courses can sometimes be accepted for transfer credit. No transfer credit will be accepted in lieu of CTPR 290 , CTPR 294 , CTPR 295 , CTPR 310 , CTPR 507 and CTPR 508 and any advanced production courses. No transfer credits are accepted for the Peter Stark producing track, the graduate programs in animation and digital arts, screenwriting and interactive media. Transfer policy for the PhD requires advisement and approval of the division chair. Under special circumstances waivers and substitutions are granted; check with the Cinematic Arts Office of Student Affairs. All course waivers and substitutions must be approved by the associate dean of academic affairs. The following courses cannot be waived for students majoring in Film and Television Production: CTIN 584a , CTIN 584b , CTIN 584c , CTIN 584z , CTPR 290 , CTPR 294 , CTPR 295 , CTPR 310 , CTPR 480 , CTPR 507 , CTPR 508 , CTPR 546L , CTPR 547L , CTPR 581a , CTPR 581b , CTPR 581c , CTPR 581z , CTPR 582a , CTPR 582b , CTPR 582z , CTPR 583 , CTPR 587a , CTPR 587b , CTPR 587c , CTPR 587z . Each program has its own advisement system. Check with the program administrator or with the Cinematic Arts Office of Student Affairs. Cinematic Arts student affairs counselors are available to answer questions about degree programs, grades, advisement and other matters. A minimum grade of C, 2.0 (A = 4.0), must be earned in all required and prerequisite courses in order to progress to the next course level. Students may attempt to improve a grade lower than a C (2.0) only one time by registering and retaking the specific course. Departmental approval is required in order to retake a School of Cinematic Arts course. In addition, a minimum grade point average must be achieved to earn all cinematic arts degrees (see the individual program descriptions). For example, undergraduates and graduates must earn a minimum grade of C (2.0) in all required cinematic arts courses. However, graduate students must also achieve a B (3.0) average in all courses required for the degree. Undergraduate students in the film and television production program who achieve a grade lower than a C (2.0) in CTPR 290 (BFA only), CTPR 294 , CTPR 295 and CTPR 310 , and graduate students in the production program who earn a grade lower than a C (2.0) in CTPR 507 and CTPR 508 may petition to retake the required sequence only once. Permission to retake any prerequisite or core production courses requires prior departmental committee approval. Students in the School of Cinematic Arts' graduate programs pay differential tuition (see the Tuition and Fees section for current tuition rates). Undergraduate programs are assessed the university-wide tuition rate with a once-a-semester access fee of $50. In addition, some classes are charged lab fees, as noted in the Schedule of Classes, and insurance fees. The university reserves the right to assess new fees or charges. The rates listed are subject to change without notice by action of the Board of Trustees. The minor in animation offers students an introduction to the theory and practice of animation, including its relationship to the history of art and cinema, creative writing, and basic film production. It provides students with an opportunity to create both personal and collaborative work in a wide range of genres, from traditional character to contemporary experimental and computer animation. The program requires 24 units. For more information, see here. A minor in cinematic arts is available to USC undergraduate students in all schools and departments. The minor provides the opportunity for students to become familiar with various aspects of media study. The program requires 20 units. For more information, see here. The minor in comedy is designed to train students in the creation of comedic entertainment in film, television and new media. The program utilizes both analysis courses and creative workshops to train students in comedic theory and practice. Through elective choices students may focus their studies on a number of cinematic disciplines as they pertain to the creation of comedic content, including writing sit-coms, directing comedic actors and producing sketch comedy. The program requires 16 units. For more information, see here. The minor in digital studies explores the rich potential of digital media for critical analysis and creative discovery. Learning the exciting and dynamic potential of a broad array of tools and technologies, students create innovative projects, from photo essays to Web-based documentaries, from interactive videos to sophisticated Websites, and from typography in motion to 3-D visualizations. The program requires 20 units. For more information, see here. The minor in entertainment industry provides students interested in media content creation with a focused curriculum that will give them insight into the economic factors and professional practices that influence the creative process, and how they interact with social, historical, technical and aesthetic elements. For more information, see here. The skills of the modern animator, visual effects artist, motion capture professional and many others are of great value in the games industry when paired with an understanding of how these assets can be used in games and systems. The game animation minor provides an educational path that teaches both systems thinking and the skills and creativity of an animator. The program requires 24 units. For more information, see here. Game audio professionals must not only be competent in one area (e.g., expressly in music composing or in audio recording), but also in other areas of audio and in theories of procedurality and interaction. This minor provides a grounding in game design and systems thinking, while providing a theoretical backing and skills in audio design and composition to prepare students to design successful audio for the games industry. The program requires 24 units. For more information, see here. Design for games is a young, exciting field applicable to media artists working all over the world, in different aspects of the industry and with many different tools. The game design minor teaches basic iterative design and prototyping skills while providing students the opportunity to explore design for new technologies and the skills of user assessment and usability testing. The program requires 24 units. For more information, see here. The modern media, technology and entertainment fields are built on the backs of new businesses and new ideas. To start a successful business, you need skills and knowledge of the processes for setting up a business, finding investment and turning your creative project from prototype to finished project. The game entrepreneurism minor provides an educational path that teaches hard business thinking for creative entrepreneurs. The program requires 24 units. For more information, see here. Games are a major cultural form, with game sales now exceeding box office revenue in the United States. Attention to games and interactive media is growing, and it has become necessary to understand them as meaningful systems, reflect on their cultural influence, and to help guide their evolution with insightful criticism. The game studies minor prepares students with fundamental underpinnings in media criticism and games. For more information, see here. Game and interaction design are deeply dependent upon human-computer interaction and the ability to use research methods to improve player experience. This minor is designed to give students an underpinning in game design, interface design and research methods, while teaching a full set of skills for playtesting and usability practice. The program requires 24 units. For more information, see here. The minor in media and social change provides the opportunity for students who are interested in media content creation and research to take classes in a focused curriculum on the various aspects of media for change. Students will gain insight into the professional practices of creating media content, analyzing existing content, and learning how they can influence the future by integrating social issues into the work they are doing in related fields. The program requires 16 units. For more information, see here. The minor in science visualization offers an introduction to science visualization methodology and practice focused in an area of relevant research. The minor is structured to provide the skills and knowledge needed in science visualization, and will culminate in a capstone project under the close supervision of faculty in both animation and science. The program requires 16 units. For more information, see here. The minor in screenwriting provides thorough training in the craft of writing for screen and television. Students learn the fundamentals of character, conflict and scene structure and build on their skills through each course as they write feature and television scripts in all genres and explore areas of their interest. Students may apply in the spring or fall semester. The program requires 16 units. For more information, see here. This 24-unit minor is designed for students who plan to enter careers or professional programs in medicine after graduation and are interested in working with film and television producers to disseminate accurate health information to the public. See the Keck School of Medicine of USC for course requirements. This interdisciplinary minor integrates three major disciplines (fine arts, computer science and interactive media) to develop the 2-D visual skills necessary to conceptualize and illustrate images for games. For more information, see USC Roski School of Art and Design . The focus of the 3-D Art for Games minor is a trans-disciplinary approach that incorporates the creative, technological and team-based communication skills necessary to develop 3-D art skills for video games. For more information, see USC Roski School of Art and Design . The 3-D animation minor merges theoretical concepts and practical skills, to prepare students for a career in their major field of work with incorporation of 3-D animation and interactive technologies. Through integration of three major disciplines (cinematic arts, fine arts and information technology), students gain a solid foundation in a wide range of important industry and academic skills. See the Information Technology Program for course requirements. The video game design minor integrates theoretical concepts and practical skills to prepare students for a career in interactive entertainment, specifically the video game industry. Through integration of two major disciplines (cinematic arts and information technology), students will be exposed to a variety of design concepts related to creating video games. See the Information Technology Program for course requirements. For specific information on admission and application procedures, contact the School of Cinematic Arts at (213) 821-2515 or the Information Technology Program at (213) 740-4542. The minor in Performing Arts provides an interdisciplinary inquiry into the nature and aesthetics of the performing arts. It combines the disciplines of cinematic arts, dance, music and theatre. The minor is a unique course of study that looks at how the performing arts contribute to a culturally literate society. See USC School of Dramatic Arts for requirements. John C. Hench Animation and Digital Arts and the Division of Media Arts and practice jointly offer, with the Roski School of Art and Design, a fall semester abroad at Studio Art Centers International (SACI) in Florence, Italy. Undergraduate students will be required to take equivalent classes in animation and media arts while also benefiting from the wide range of liberal arts courses offered at SACI. "Documenting the Global City: Los Angeles and Beijing," is an intensive, seven-week workshop in documentary filming that pairs graduate students from the USC School of Cinematic Arts and the Communication University of China (CUC) to make short documentaries on Los Angeles or Beijing as global cities. The program is held in Los Angeles or Beijing in alternate years. It will be held in Beijing in summer 2016. Participating students enroll in CTPR 515 Global Exchange Workshop (2 units). With faculty guidance from both universities, the students must negotiate cultural differences both in front of and behind the camera. In the process, both students and faculty directly experience the other culture and learn how it defines globalism in general, sees its own city in global terms, combines theory and practice, and processes a new set of perceptions and lived experience. Interested students should contact Professor Mark Harris of the division of Film and Video Production at (213) 740-3319, or at mharris@cinema.usc.edu. Airfare to China and lodging expenses in Beijing are provided for all students accepted into the course.